Enter a unique name for the key; this will be entered in the key attribute in the XML. Opens a menu where you can define which keys from which sources should be shown in the drop-down list. 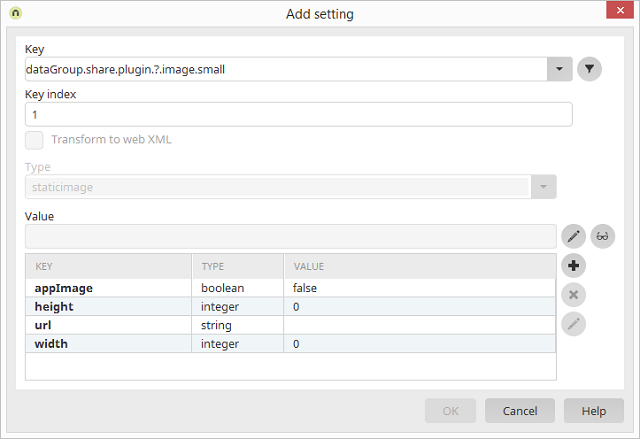 To do that, simply select the checkbox next to the source you would like. Activates or deactivates all of the checkboxes, respectively. If necessary, enter the index of the selected key here. The key's type can be modified here, provided the selected key permits this. 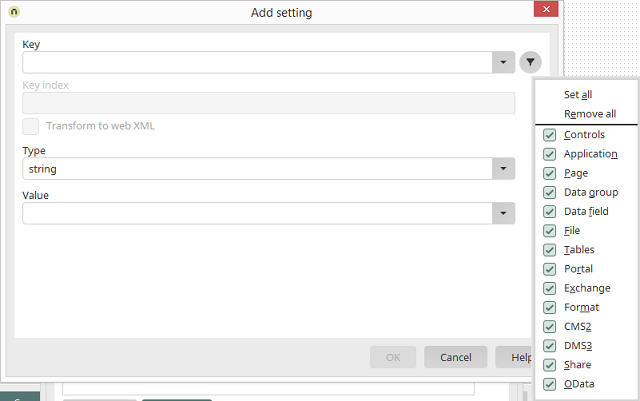 If this option is selected, the setting will be applied during the transformation to web XML. 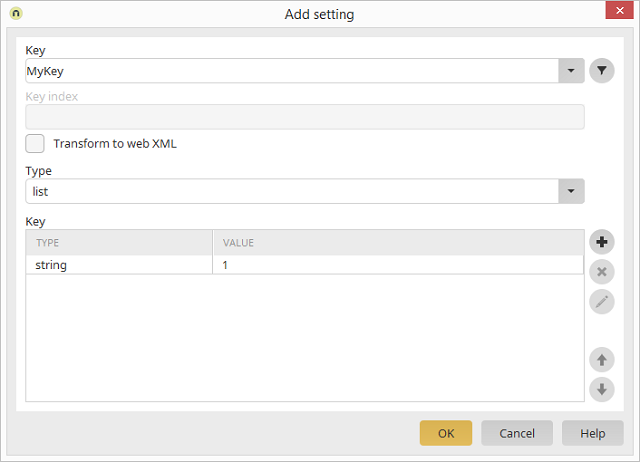 Here, you can enter the value that should be entered to the XML in the value attribute. 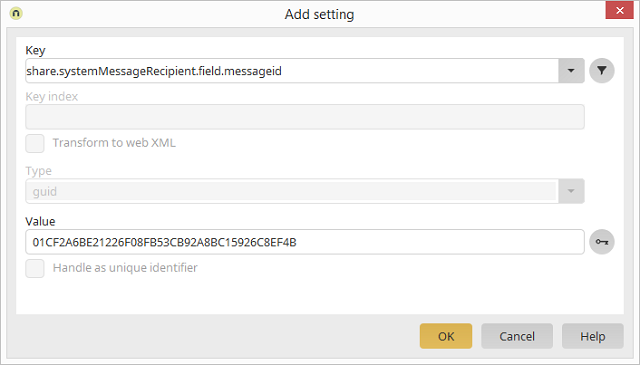 Opens a dialog where the value can be entered in multiple languages. Opens a dialog where a new entry can be defined. Deletes the currently selected entries from the list. Opens a dialog where the currently selected entry can be edited. Adjust the order of the entries. 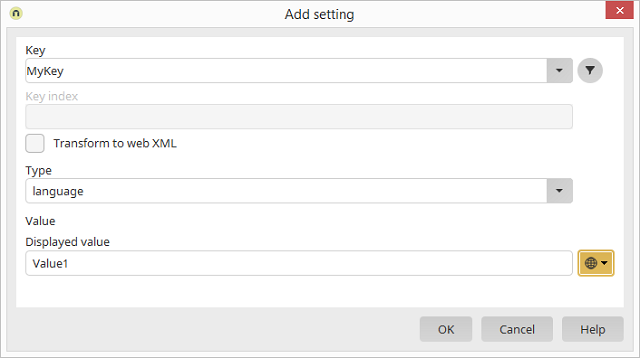 Opens a dialog where text can be entered which will be displayed instead of the image on devices which cannot display images. With this setting, a new GUID will be assigned if a copy of the setting is created (e.g. when the application is copied). In various places in Intrexx, e.g. categories in the calendar element or in drop-down lists, displayed values can be compiled. These can then be separated. As well as the default restrictions, two additional map entries can be defined for the key "control.application.displayFields". A separator will be displayed on the left or right, respectively, if the text on the left or right, respectively, of the displayed value is empty. A separator will be displayed on the left or right, respectively, if the data field on the left or right, respectively, of the displayed value is empty.